Welcome to Over The Moon Farm! 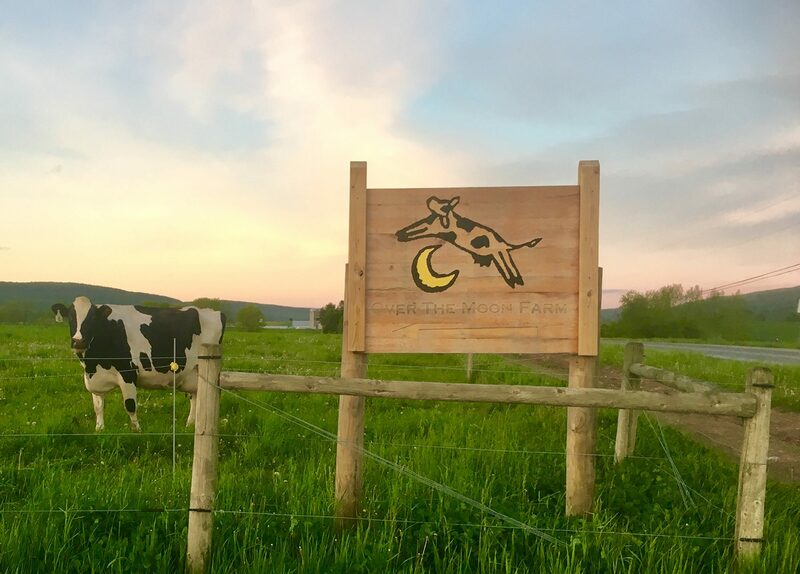 Over the Moon Farm is a small, grass-based organic farm in the Ridge and Valley Province of Central Pennsylvania. We raise hay, chickens, turkeys and pigs. We also have a lovely little Cottage getaway at the farm and a beautiful barn available for group events. Our farm is certified organic. 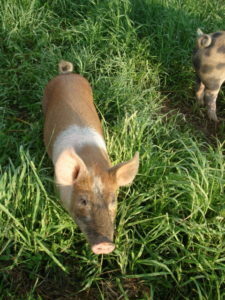 We use only manures and lime on the soil and feed the animals (chickens, turkeys) either certified organic grains or (pigs) minerals and “natural” grains that are non-GMO and locally-raised and milled. Feeds do not contain “non-food additives” common in commercial feed (antibiotics, growth promoters such as arsenic, etc.). Animals are raised with access to the outdoors as much as possible given their ages, predator pressure and conditions of the pastures and weather cycle. The animals are humanely raised and safely processed at local butchers. You are welcome to visit our farm anytime and see all of this for yourself. We recognize that it takes extra time and effort to find, buy and store locally produced, seasonally available food. However, with recent events in the world, the importance of building local food networks has never been greater. Consider the “quality” of industrial meats and other foods, food safety issues, chemical residues, our carbon footprint and food sovereignty. Now we hear that US chicken will be sent to China for processing and sent back for consumption here (1) and Chinese companies are buying Smithfield, the largest pork company in the world (2). Do YOU want your food coming from China?? The act of buying local food, besides providing you with the best, healthiest food on the planet, is assuring the survival of small farms and a thriving farm economy in your own neighborhood. 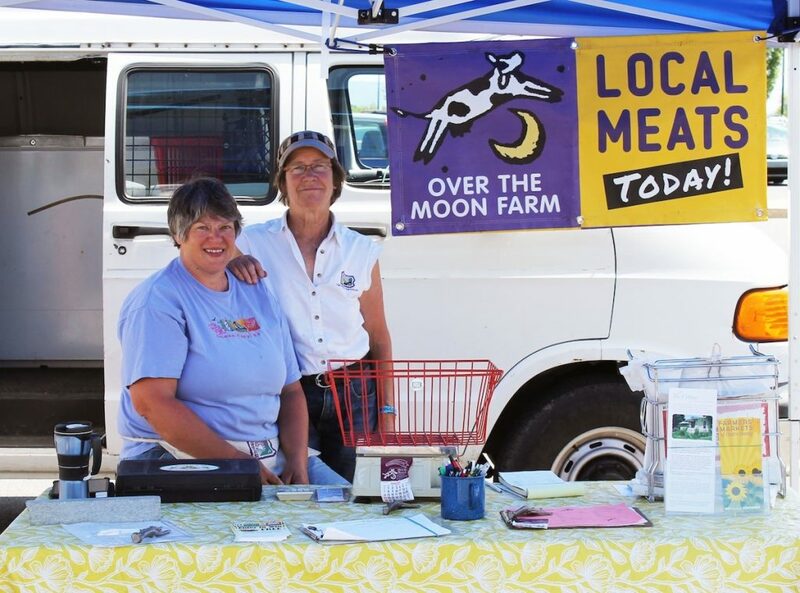 Your food dollar is going almost 100% to support the local farm economy. Our daily farm operation pays the organic farmer that grows the grains we use, the suppliers of chicks, local store-keepers, hardware stores, farm supply and repair shops, our processors, our neighbors who sell us straw and hay – all local, small farmers and businesses. It’s this simple: your vote with your dollar helps us all to keep a viable local economy! Farmers and eaters need each other to stay healthy physically and economically! I was interested in farms, ranches and the natural world since childhood, although no one in our family farmed. It only took me 50 yrs to get my own farm! In college I studied biology, ecology, botany, zoology and a couple languages. My studies took me to Central and South America where I studied tropical ecology, leaf-cutter ants and observed various types of farming systems. At University of California in Santa Cruz I worked as the coordinator of the Apprenticeship in Ecological Horticulture for 8 years before coming to State College, PA. I began working for the Integrated Pest Management Program at Penn State University (see paipm.org) and also got involved with the newly formed Pennsylvania Association for Sustainable Agriculture (PASA – see pasafarming.org). At PASA, I served as secretary for as long as they would have me. I also trained as an Independent Organic Inspector and conducted farm inspections for PA Certified Organic. During this time I realized that if I wanted to farm, NOW was the time. My joke was that the median age of farmers was 50 yrs anyway, so that was perfect! I rented some farmland for a couple years and then took the plunge to buy my own place. I have been farming at this site since 1998 while continuing to work at Penn State as part of the IPM Program. I came to the farm in 2003 looking for a place to live. I fell in love with farming and so I’m still here. The location is very reminiscent of where I grew up in The Big Valley (Belleville, PA). At the time I moved here I was working as a Research Technician at Penn State and had recently graduated in Horticulture/Landscape Design (or as Lyn calls it ‘Landscraping’). I’ve since learned to meld my horticulture and landscaping into providing healthy environments for our animals and beautiful respite spots for the farmers. I have since worked at Pennsylvania Certified Organic as a Certification Specialist and Organic Transition Specialist. Through the farmers and others I met during that time I learned a great deal about farming and the value of local food. I have also worked at PA Association for Sustainable Agriculture (PASA) as the Registration Associate for their annual Farming for the Future Conference. I met many wonderful farmers, interns, educators and service personnel that have built a foundation for my farming community. I presently work for the Pennsylvania Women’s Agricultural Network (PA WAgN) at Penn State where I organize field days, workshops, webinars (we call them farminars), study circles and other networking events with some pretty awesome women farmers. It inspires me daily to learn the obstacles women farmers face and the creative resources they use to overcome them. I am proud to be one of the growing number of women farmers in PA.